Neutrogena Body Clear Body Wash with salicylic acid 8.5 fl oz (250ml). 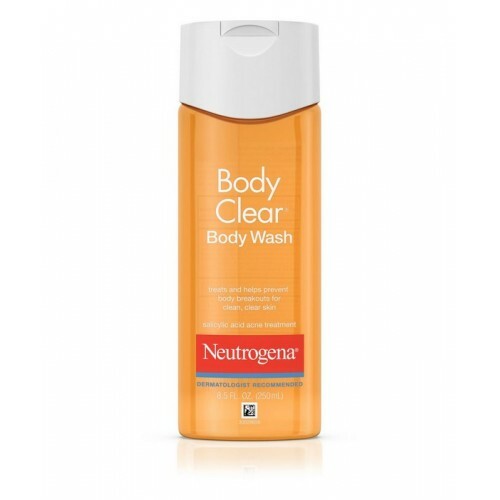 Neutrogena Body Clear Body Wash is a refreshing, clean-rinsing and oil free body wash that treats and helps prevent body acne. This unique formula features the maximum strength acne medicine salicylic acid 2%. It's specially developed to treat body breakouts such as those on your back, shoulders and chest without over-drying. 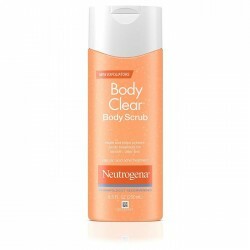 Body wash with salicylic acid acne treatment specially designed for acne prone skin. The effective formula contains salicylic acid 2%, which treats and helps prevent breakouts, without over-drying skin. 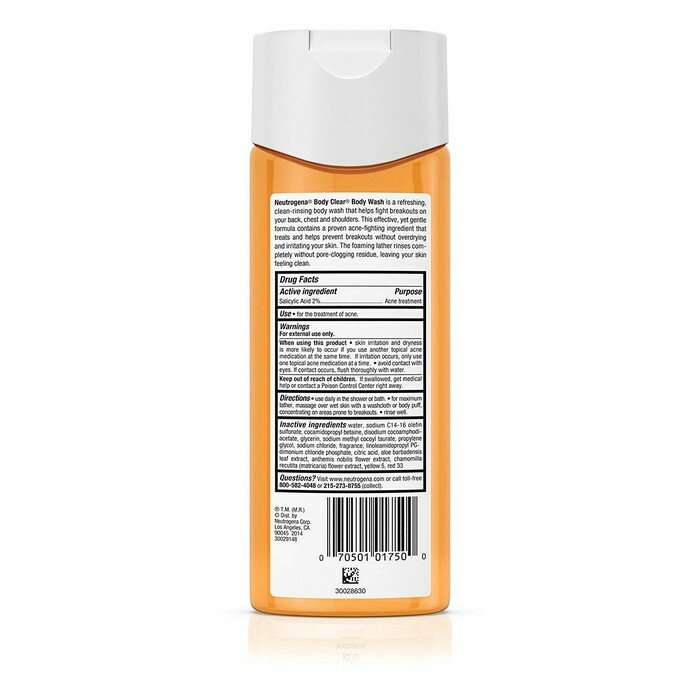 Refreshing body wash fights acne and breakouts on your back, chest and shoulders. 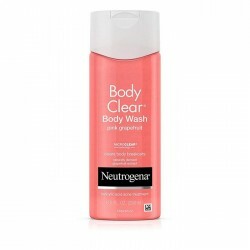 Lathering body wash rinses clean without leaving behind a pore-clogging residue and will leave your skin feeling fresh. Water, Sodium C14-16 Olefin Sulfonate, Cocamidopropyl Betaine, Disodium Cocoamphodiacetate, Glycerin, Sodium Methyl Cocoyl Taurate, Sodium Chloride, Propylene Glycol, Linoleamidopropyl PG-Dimonium Chloride Phosphate, Fragrance, Citric Acid, Aloe Barbadensis Leaf Extract, Anthemis Nobilis Flower Extract, Chamomilla Recutita (Matricaria) Flower Extract, Yellow 5, Red 33.